Are you juggling a project backlog that keeps you from delivering any of them on time? Are you struggling with resource constraints that keep you from making progress? If either of these challenges sounds familiar to you, then the Mainstream Way can help. We’re passionate about solving business challenges with technology. 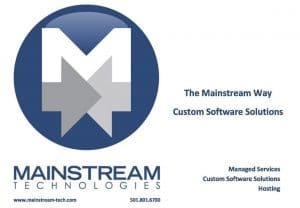 Whether you need to add features to an existing application or you need a completely new solution, the Mainstream Way gives you the flexibility and experience you need to lay the groundwork for delivering new features faster than ever before. Meet today’s needs with an eye to the future. The Mainstream Way operates using three key features. During the lifecycle of a project, different skills are needed at different times. LEAN SOURCING™ gives you the ability to access to the skills you need when you need them for only as long as you need them. Imagine the possibilities of having the flexibility of extending your staff with skilled resources who are familiar with your business without a long term commitment. Frequent feedback and a closely aligned team assure the highest impact possible for your organization as quickly as possible. CONSULTING™ puts our experience to work for you by raising awareness of the possibilities to enhance and streamline business processes during the development process to improve operational efficiency and usability. TOGETHER we assure your initial goals are exceeded by the end product. We understand that custom software is a significant investment which is why the Mainstream Way has been so well received in both the private and the public sector. It offers extensive experience and the utmost in flexibility to assure the quality of your solution will last. If you’d like to discuss your organizational challenges and how technology can play a role in solving them give us a call @ 501-801-6700 or send an email through our Contact Us page.